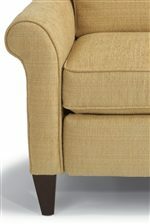 This casual styled sofa will add plush seating to your living room or family room. The curved shape encourages conversation between family and friends, and creates the perfect space to entertain guests. Sink into the plump box seat cushions and plush back cushions, and relax while watching a movie or reading a book. Gently rolled arms and tapered wood legs add a modern touch to this classic sofa. Available in over 1,000 fabrics and several leather options, allowing you to customize the look and feel of this sofa. 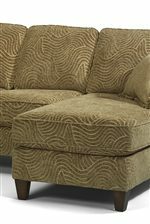 The Westside Casual Conversation Sofa by Flexsteel at Williams & Kay in the Anchorage, Mat-Su Valley, Eagle River, Alaska area. Product availability may vary. Contact us for the most current availability on this product. 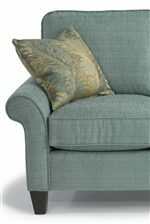 The Westside collection is a great option if you are looking for Casual furniture in the Anchorage, Mat-Su Valley, Eagle River, Alaska area. Browse other items in the Westside collection from Williams & Kay in the Anchorage, Mat-Su Valley, Eagle River, Alaska area.